In the past, cord-cutters had to give up some of their favorite cable news channels when they cut the cord, including HLN – but not anymore. Today, there are plenty of options for watching HLN without cable. Keep reading to learn more about the best cable alternatives. Cable companies used to have a monopoly on cable news, as well as every other cable channel. To get cable channels, you’d need cable. Well, that’s not the case anymore. More Americans are choosing to cut the cord on costly cable subscriptions. In turn, this has led to the rise of “skinny bundle” internet TV services. These services, such as YouTube TV and DirecTV Now, allow you to subscribe to a customized, streamlined bundle of cable channels. Skinny bundles deliver cable channels directly over the internet, without requiring a cable subscription, or a cable technician to set them up. They also are contract-free, so you can subscribe month-to-month without any long-term contracts or cancellation fees. Most of these services cost from $20-$50, providing significant cost savings compared to cable. Here are your top six choices for watching HLN live without cable. Sling TV is the oldest internet TV company. They do things a bit differently than other internet TV companies, with their “a la carte” approach. You can choose a base subscription such as Sling Orange ($25/month for about 30 channels) or Sling Blue ($25/month for about 45 channels) and then customize it with “extras” and “mini” add-ons. You also have the option to combine Sling Blue + Orange for $40/month. See our full Sling TV review for customization details. HLN is not part of the base-tier Sling Orange or Sling Blue package. You’ll need to buy the $5/month “News Extra” package to get HLN. This package also includes CNBC, BBC World News, RT, MSNBC, and TheBlaze, among a few other channels. Sling TV does have a DVR, but it’s not free. You have to pay $5/month extra to get 50 hours of recording time. The DVR works well but is blocked on some channels such as ESPN and other Disney-owned networks. This is not uncommon with other services, however, and even some local broadcast networks from CBS, Fox, NBC, and ABC also disallow DVR recording through services like Sling. You can only stream on one device at a time with Sling Orange. This is quite limiting, making Sling Orange a poor choice for anyone who is planning to share their internet TV subscription. However, you can stream on up to three devices with Sling Blue. You can stream Sling TV on pretty much every platform. The service supports common streaming platforms such as Chromecast, Roku, Apple TV, Amazon Fire TV, and even Samsung/LG Smart TVs. You can also stream on your web browser, and all iOS/Android mobile devices. The main reason most people choose Sling TV is because it’s inexpensive. But if you add HLN and a DVR to the cost of your Sling Orange subscription, the cost is $35. For Sling Blue, it would also be $35. This makes the whole combination package still cheaper than one of Sling TV’s chief competitors, DirecTV Now. Still, you can get a free 7-day trial of the service, so you can give it a shot, and see if you like it. Hulu With Live TV was released late last year and is still technically in Beta. But it’s quickly become a great alternative to cable. Hulu With Live TV costs $40/month, and only has a single package to choose from. You’ll get HLN, as well as CNN, CNN International, MSNBC and CNBC, Fox News and Fox Business. It’s a great overall package of channels, especially if you are a cable news fan. You get all of the “Big Three” channels and plenty of other coverage for sports and entertainment. With a base subscription, you will only be able to stream on two devices at once. You can remove this restriction with the $15/month “Unlimited Screens” package. This allows you to stream on up to 3 devices outside your home network, and as many as you want while on your home Wi-Fi network. Hulu With Live TV also comes with a DVR. You get 50 hours of storage without any other restrictions. Not enough for you? You can pay $15/month for the “Enhanced DVR” package, and expand it to 200 hours. You can also combine both of these add-ons for $20/month, if desired. Another benefit of Hulu With Live TV is that you get a free base-tier Hulu subscription (an $8/month value). You can watch all of Hulu’s library of TV shows, movies, and original content for no extra charge. Hulu has good platform support, too. Today, you can stream on iOS and Android devices, as well as web browsers, late-generation Apple TVs, Amazon Fire, Chromecast, and some Roku devices. Samsung Smart TVs and the Xbox 360/One consoles are also supported. For $40/month, Hulu With Live TV is a great deal, especially because you get a good DVR and full access to Hulu archived VOD content. If you don’t already have a Hulu subscription, it’s definitely worth looking into subscribing to Hulu With Live TV. You’ll get both live news coverage and plenty of on-demand content. You can check it out with a free 7-day trial now. YouTube TV is one of the latest entrants into the world of Internet TV. YouTube TV costs $35/month as of the publication date. However, on March 13, it will be $40/month. This price hike will come with additional channels, though, such as TBS, TNT, and Cartoon Network. With YouTube TV, you get a great package of about 50 channels, depending on your location. HLN is included, as is Fox News, CNN, CNBC and MSNBC, and Newsy. You will also get a 3-device simultaneous streaming policy, and support for up to 6 different user accounts, making YouTube TV a pretty good choice for families. The biggest feature of the service, though, is the DVR. It’s simply the best around. You can record unlimited shows for up to 9 months, without any other restrictions. Device support was limited upon release, but YouTube TV is now expanding to most streaming platforms. iOS/Android are both supported. You can also watch on your web browser, and streaming devices such as Roku, Apple TV and Android TV, Xbox One, and some Samsung and LG Smart TVs. YouTube TV has a great package of channels and stellar features. Despite the fact that it’s increasing in price, it’s still a great cable alternative, and a good way to watch HLN without cable. You can try it for yourself now with a free trial at the YouTube TV website. DirecTV Now is an internet streaming service from AT&T and DirecTV. Given that it’s run by one of the largest pay-TV companies in the world, it’s no surprise that DirecTV Now offers a great selection of channels. You have four options for your subscription. You’ll get HLN in the most inexpensive $35/month “Live A Little” package. Included in this base-tier package is C-SPAN, Fox Business and Fox News, CNN, Bloomberg, MSNBC, and CNBC. You get 60+ channels total, depending on your location. Although DirecTV Now does have a fantastic selection of channels, it isn’t perfect. In fact it is quite lacking in features. The first issue is with its DVR. DirecTV Now started offering a cloud DVR option this year after a lot of stalling. While the service initially promised a 100-hour DVR, upon release, it only offered 20 hours. Additionally, you only get to keep those videos for 30 days, which makes DirecTV Now’s DVR one of the most restrictive options on the market. The second issue with DirecTV Now is that you can only stream on 2 devices at once, which is not exactly family-friendly. Again, the company plans on raising this to a 3 device limit sometime in late spring. On the other hand, DirecTV Now gives you access to 25,000+ on-demand titles, and the service supports most major streaming platforms. You can also use your DirecTV Now login to access CNN Go, and watch CNN, HLN, and more on the CNN Go mobile app and web browser. You can watch DirecTV Now on Chromecast, Amazon Fire TV, Roku, Apple TV, and some Smart TVs. iOS/Android devices support DirecTV Now, and you can also watch on your web browser. If you don’t really need a DVR and you’re not bothered by being able to only stream on 2 devices at once, DirecTV Now is a great way to get your favorite cable news channels without breaking the bank. At $35/month, the “Live A Little” package is a great value. Give the service a shot now for free with a 7-day trial. PlayStation Vue has a confusing name (you don’t need a PlayStation console to subscribe) which may explain why it’s having a tough time competing with other internet TV services. You get HLN with the lowest-tier “Access” package, along with about 45 other channels (this number could vary, based on your location. You also get news coverage from CNBC and CNN, as well as Fox News. To get more coverage of sports and entertainment, you’ll want to upgrade to the $45/month “Core” package which will unlock quite a few more channels. The channel selection is not quite as robust as DirecTV Now or Hulu With Live TV. However, there are a few reasons you may still want to consider PlayStation Vue. First, you get an incredible five device simultaneous streaming policy. This is the best streaming policy in the business (with the exception of Hulu With Live TV + Unlimited Screens, which costs $55/month). You also get a 28-day unlimited DVR, which means you won’t have to worry about running out of space. If you subscribe, you can also use your PlayStation Vue credentials to log into CNN Go, which is a nice bonus. PlayStation Vue currently supports most streaming platforms. iOS and Android, as well as web browsers are supported. Naturally, so are the PlayStation 3/4 consoles. You can also stream on Chromecast, Roku, Amazon Fire TV, and Apple TV. PlayStation Vue combines a pretty good selection of channels with incredible features. It’s definitely the best option for cord-cutters who need to share an internet TV subscription with their family members or household. You can try it out for yourself with a free 5-day trial now. You can use your internet TV login to watch HLN on the CNNGo app (HLN used to be CNN2, and is still owned by the company). 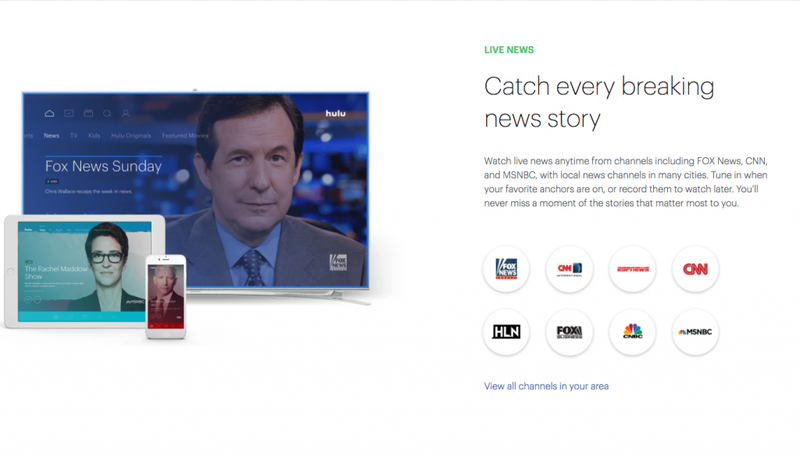 However, for some reason, CNN does not currently support logins from Hulu With Live TV, Sling, or YouTube TV. You can only use PlayStation Vue or DirecTV Now to login to the CNN Go app. Once you’re signed in, you’ll be able to watch live streams of CNN and HLN and view some on-demand archived content. Why bother? Well, CNNGo does not count against your simultaneous streams, for one thing. If you have DirecTV Now, for example, you can watch CNNGo, and your family can still watch two more streams using the DirecTV Now service.